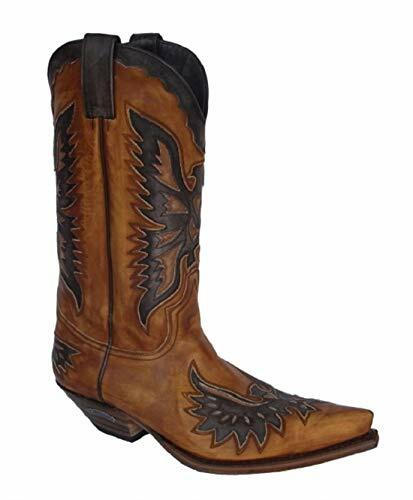 An amazing pair of Sendra cowboy boots. These boots will make people stop and stare as they ooze quality craftmanship. Handmade in Spain using traditional methods these are a pair of beauties worth every penny. Material Composition: Leatherboots! Offer exclusively by mosquito boots & shoes! Sendra Western / Cowboy Boots article 8994 conac - brown / classic Western Boots - well pointed toe / oiled nobukleather - leathersole / handmade - "goodyear welted" by SENDRA in Spain / well inclined, laminated, massive heel ca. 4 cm // Incl. 1 original MOSQUITO bootjack per order!